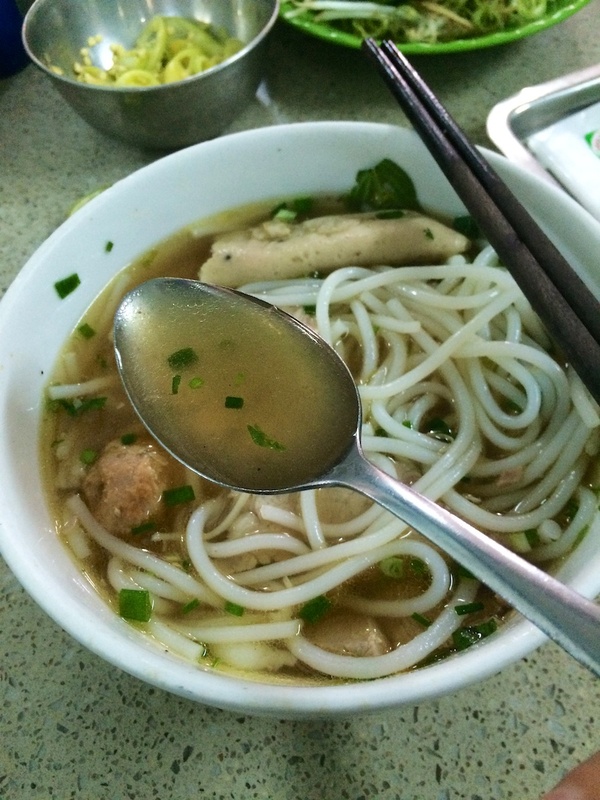 Bún bò Huế or how one of my friends call it “a bowl of the booms”, is a well-known beef noodle soup from Huế, Vietnam central city. 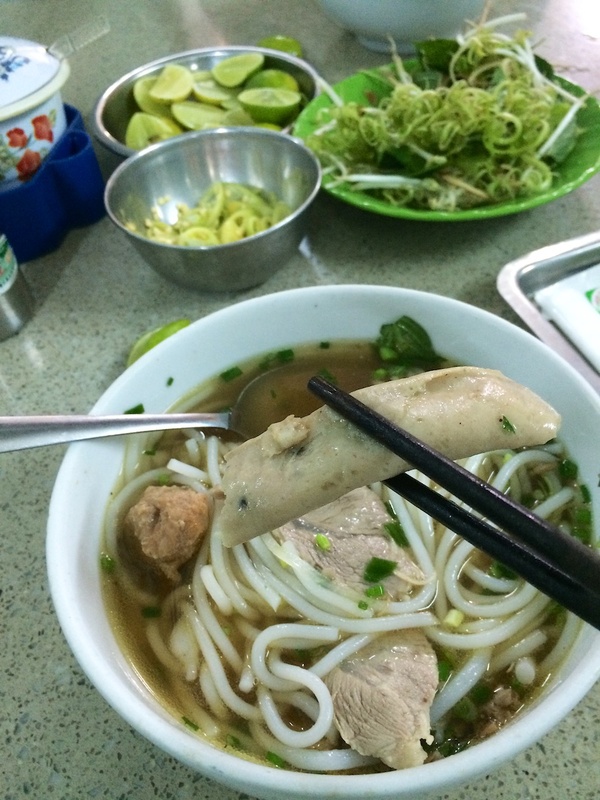 It’s a perfect balance between the 4 S’s: sweet, spicy, sour, and salty, so it’s a no-brainer that we have to have this as our first welcome to Vietnam meal. Come and taste it with me! Now this dish started a heated debated on Daniel’s Facebook, because of the color of the soup. Do you see white and gold or blue and black? Haha, just kidding — don’t hate me. What I know about the look of this dish growing up is that the soup is cloudy with a thin layer of red pepper oil on top of the soup, but this contradicts everything — The soup is clear and no red layer on top. However, don’t let this stop you from trying it because one sip of the soup will make you question your mom’s very own red soup. Haha, just kidding again, I’ll never question my mama’s booms. Clear soup Bun bo Hue! 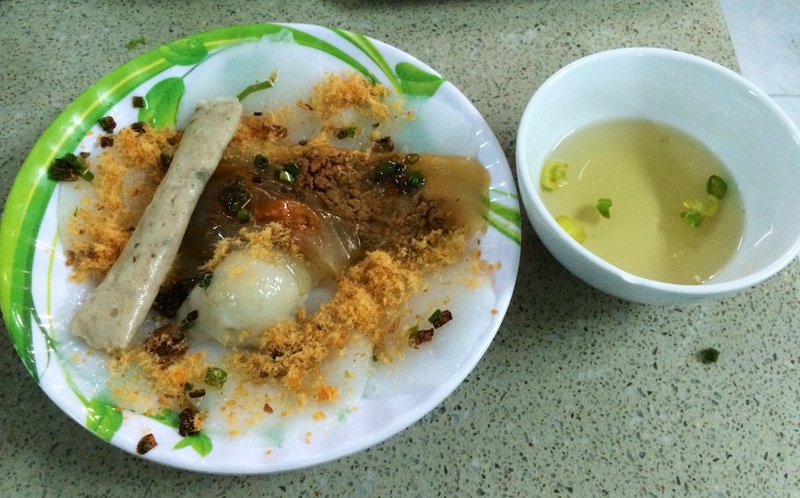 The broth is made from shimmering beef bones, beef shanks, lemongrass, fermented shrimp, and sugar. The combination of flavors is pungent, but in a very good way. It has all the right kicks and subtlety from the lemongrass and fermented shrimp. The noodles are a little thicker so it has a more of a bite. A final squeeze of a lime wedge is all you really need before slurping up the soup. This is one of my favorite dishes of all time. I’ll be the first to admit that I’m not a soup person. I never order soup-based food, because of the amount of salt and MSG in it so I always opt for dry dishes, but as a testament to how good this soup is, I drank the whole bowl. I was willing to deal with the dry mouth and thirst all day, because the combination of flavors is like crack! One bite of this pork roll and you’ll know that this is home-made and not packed with fillers. What doesn’t hurt either is that my small bowl cost 38,000 Dong ~ $1.80 USD and about $2.25 USD for a large. Say what?!?! Yup, you can eat like a king here! Now you go on and look past the craziness and gelatinous of the food, because the taste is a different story. It’s bursting with flavors and it’s such a teaser. Don’t worry though, I’m on a mission to find great places that serve these food individually and I will let you know more about it!